Filter Forge, Inc. today announced an unprecedented 70% holiday discount for its flagship product, Filter Forge 2.0, a high-end plugin for Adobe Photoshop allowing computer artists to build their own filters -- textures, visual effects, distortions, patterns, backgrounds, frames and more. Filter Forge, Inc. today announced an unprecedented 70% holiday discount for its flagship product, Filter Forge 2.0. Filter Forge, Inc. today announced an unprecedented 70% holiday discount for its flagship product, Filter Forge 2.0, a high-end plugin for Adobe Photoshop allowing computer artists to build their own filters – textures, visual effects, distortions, patterns, backgrounds, frames and more. The key features of Filter Forge include a visual filter editor and a free online library of over 7500 user-created textures and effects. This unique opportunity to get Filter Forge at the all-time low price is available starting November 22, 2010. Under this offer, the Basic edition of Filter Forge, aimed at entry-level users, costs $45 instead of $149; the Standard edition, designed for mainstream graphic artists, $75 instead of $249; and the Professional edition, targeted at graphics professionals, $119 instead of $399. 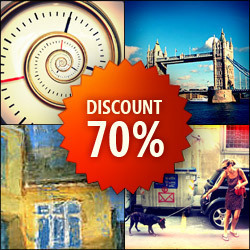 The discount is time-limited and cannot be combined with other promotions. To buy Filter Forge at a 70% discount and save up to $280, click here: http://www.filterforge.com/buy/. "This is the first time in our history that we're offering such a huge discount," says Vladimir Golovin, CEO of Filter Forge, Inc. "Holiday discounts always worked great for us, but we haven't tried anything this radical before. Let's see how it goes!" Filter Forge is a versatile Photoshop plugin which lets both novice and expert users create a wide variety of realistic and abstract textures and effects. Users can take instant advantage of over 7500 free community-created filters in the online filter library at http://www.filterforge.com/filters/, or create their own filters in the visual filter editor by assembling them from components such as blurs, gradients, color adjustments, noises, distortions, or blends. All filters are adjustable, resolution independent, support real-world HDRI lighting and ambient occlusion, can automatically generate diffuse, specular, bump, and normal maps, and most can be seamlessly tiled.